Based in Torrington, Connecticut, Tilson & Associates was founded by Stephen B. Tilson in response to a growing need for professional field training in the collection system industry. These training services were designed to provide field operators with both background and best practices information which can be applied to their specific operational circumstance. From those beginnings, the Company has grown into a unique service provider in the industry. We can provide these services ourselves or through associates who can provide specific expertise in various aspects of water and wastewater operations. A talented speaker, Mr. Tilson is in high demand nationally by client utilities both large and small, industry organization events, and state sponsored schools and conferences. 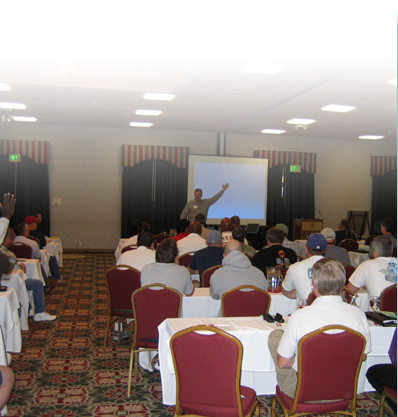 He can provide keynote address and full day seminars on various collection system operations and improvement techniques, or motivational programs for the betterment of utility personnel. His ability to communicate with most any group of employees or department heads, and the public are well noted and used by many agencies and consulting firms across the country. Beyond the business focus of the firm, Mr. Tilson is responsible for producing industry standards publications and award winning educational materials. Few people who have been in the industry more than a few years have not read his work in various publications and periodicals of the industry, training materials, and standards of practice guidelines. Among these works are the Water Environment Federation, the Manual of Practice #7, “Management of Wastewater Collection Systems”, which Mr. Tilson is responsible for production and a principal author, is currently the standard of best practices used in the industry today. This is an EPA funded best practice guide for system managers across the United States. Another well known publication Mr. Tilson authors for, is the California State University - Sacramento course, “Operation and Maintenance of Wastewater Collection Systems”. Frequently referred to as the “Sacramento Course” this is a full college level course that is the standard of education in operator and management certification programs nationally. This course has grown since its inception to become a national standard in operator training, which many utilities require operators to complete. Mr. Tilson has been and is part of a number of engineering schools in their continuing education and professional development courses offered by State Universities and Colleges across the country, which include the University of Wisconsin – Madison, University of Colorado – Boulder, Washington State University, and the Ohio State University system. Beyond his work in standards and educational materials development in the industry, many agencies utilize his expertise in a number of ways, from operator training for more effective and efficient line cleaning program development, to management training and cMOM program development. Our clients range from very large organizations such as the City of San Diego and Charlotte Mecklenburg Utilities, to small organizations such as New Milford, Connecticut and Mt. Vernon, Washington. A complete list of references is available on request. Tilson & Associates can provide a depth of service in collection systems operations that is unique in the industry. Whether in the field working with operators in equipment use and improving their effectiveness, with management in helping to determine program effectiveness and data gathering to help benchmark performance standards, or development of programs designed to reduce sanitary sewer overflows, the Company is considered one of the best in its field.